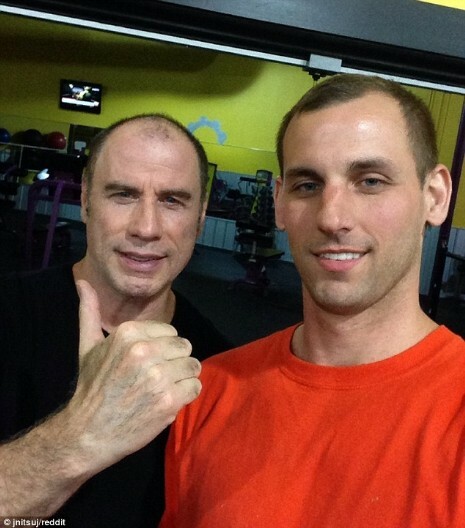 We can’t help but wonder what John Travolta, 60, was thinking when he posed for this selfie with a guy in his gym. He doesn’t have his hair on! Even more interesting, what was John doing working out AT 3 AM at Planet Fitness, not far from the Clearwater, Florida, Scientology center. The young male fan who posted the photo on Reddit was thrilled to see the actor and dumfounded when John asked him all sorts of personal questions like whether he was married and what did he do with his spare time. We already know what John does with HIS spare time. Actually, John is probably going bare-headed in preparation for his role as Robert Shapiro in “American Crime Story,” which details the OJ Simpson trial.